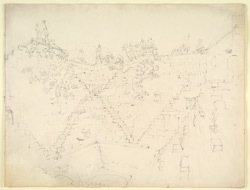 Pencil drawing by James Prinsep (1799-1840), of a step well at Varanasi (Benares)in Uttar Pradesh. The image is inscribed on the reverse: 'Section of the Ganges opposite the Minarets at low water mark 25 April 1829', together with notes and measurements. Step wells were a solution to the dry conditions in a number of Indian states; catching monsoon water and storing it in deep wells to keep it cool. They became a specialised architectural form, especially in Gujarat, where they were often very deep with numerous storeys and elaborate carvings. The one pictured here is of much simpler construction, consisting of an open well with a number of diagonal sets of steps leading down to it. James Prinsep, a noted scholar, antiquarian and Assay Master at the Benares and Calcutta Mints, came from a family who served in India for several generations. Varanasi stands on the left bank of the Ganges and at its highest point stood well away from the river, but as the ground receded towards the water stagnant pools and marshes formed near the most densely inhabited areas during the rainy season and became a danger to health. Prinsep devised a plan to drain the city and built a network of drains and a tunnel which were considered a great feat of engineering. The sewer was opened in 1824 and the tunnel, in 1827.